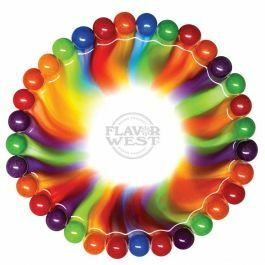 Natural rainbow candy flavor is a fantasy sensation extracted from mixed berry fruity. This multi-purpose flavoring is exceptional and stands great without adding any additional sweetener. No artificial sweeteners. Type: Candy All Natural Water Soluble Flavoring. Ingredients: Natural Flavoring, Propylene Glycol. USP Kosher Grade Flavoring. Usage Rate: 15-20% for E-use. Flavor suitability: Suitable for candy, drinks and multi-purpose flavoring. Specific Gravity: 1.10 No Refunds on Flavoring.